Noodlecake Studios, who made a name for themselves with their awesomely fun Stickman Golf and even better sequel Super Stickman Golf, return with an all-new game, Lunar Racer. 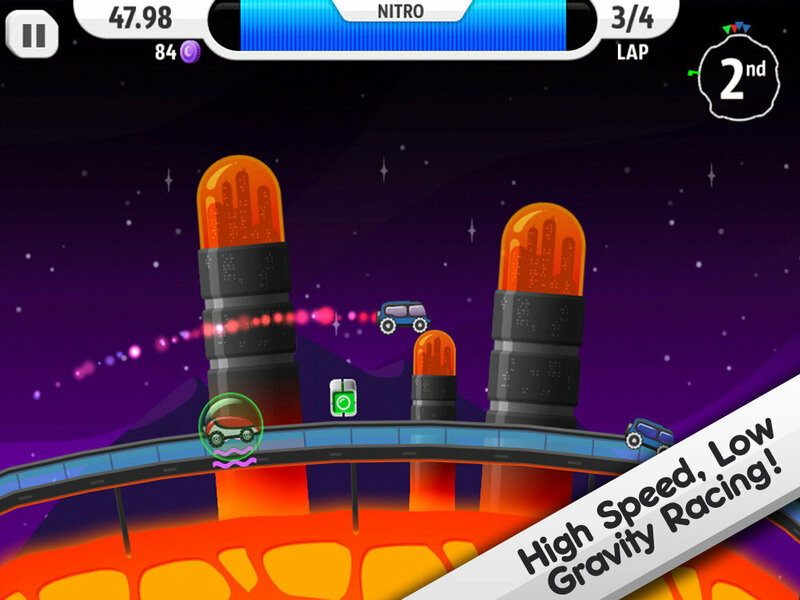 It is a gravity-challenging 2D kart racer, with the usual assortment of collects and power-ups including rockets, shields and nitro, and some elements of other fun iOS titles like Tiny Wings and Dream Track Nation. Players race around a track which circumnavigates whatever moon you happen to currently be on, trying to complete their laps first and pickup as many moon bucks as possible (more about these in a bit). Your vehicle is always moving forward and by tapping the right-hand side of the screen you can use your nitro booster to try to gain the edge. Holding down your finger longer will give you a nice little boost (and a little more airtime when launching off ramps), but you need to use it sparingly since each time you use it, it will consume some of your nitro. Don’t fear, you can replenish your nitro via a random power-up pickup on the course or by doing flips while airborne. While in the air, you simply tilt your device to the left and right to perform forward and backward flips. However, you will quickly discover that a flipping vehicle in a low-gravity situation, while load of fun, is rather difficult to land (safely). This is where the gravity assist (think Tiny Wings) comes into play. Holding your finger down on the left side of the screen activates your gravity assist, which expressly pulls your vehicle back down toward the surface of the moon, helping you to slick your landing. Lunar Racer is also both visually and aurally pleasing, featuring the same fun cartoony style that designer Ty Bader used in the Stickman Golf games and three great new soundtrack scores from composer Whitaker Trebella. The game is fairly robust in terms of content and unlockables. For each moon, there are both Amateur and Pro “tours”, as well as a three cool bonus goals which can earn you additional bonus points upon completion, helping you to unlock the Pro tour quicker. These bonus goals are usually fun tasks for you to complete during the race like “Do 4 back flips and finish 1st or second” or “Make 4 long jumps”. With races only lasting an average of 60 to 90 seconds, this is a great pick up and play game and it is easy to find time to play a few races or make an attempt at checking off one of the bonus missions. Back to those moon bucks…these can be used to purchase cosmetic upgrades for your vehicle to change its color, body style etc, allowing you to give your vehicle a personal touch. This can be particularly helpful when playing a multiplayer game. 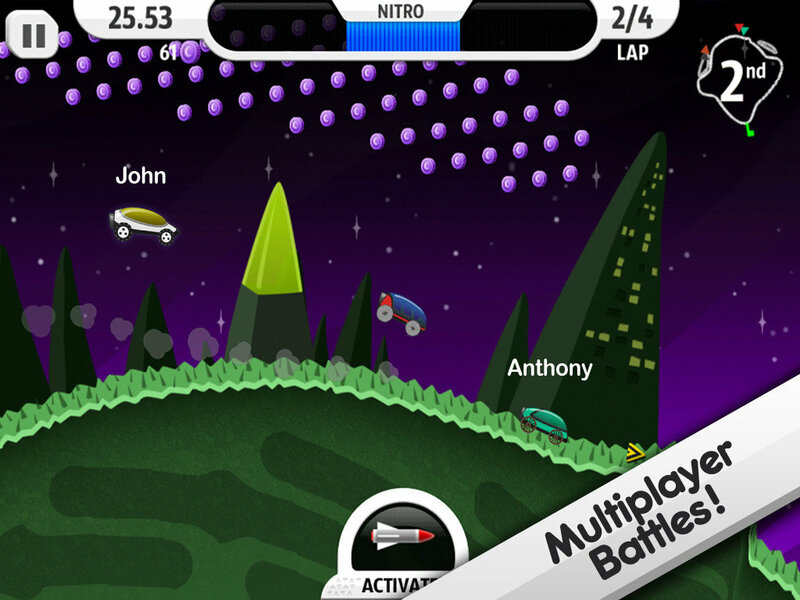 Unfortunately, unlike Super Stickman Golf, the multiplayer component of Lunar Racer is limited to Bluetooth or local Wi-Fi. From what the devs said on a recent episode of The Portable Podcast, this is due to technical limitations. Apparently there is just too much lag in the tilt controls when playing online and they were unhappy with the quality of experience that it offered. While I applaud the guys at Noodlecake for keeping their standards high, I really hope that they can MacGyver a solution for this, as pretty much all of my iOS multiplayer gaming is online. Lunar Racer is an often unforgiving racer that (especially on the Pro Tour) will require a near flawless execution if you want to be crowned the victor. The controls do take a fair bit of getting used to, for me it was mostly a tilt sensitivity issue, this is where perhaps the addition of a sensitivity slider for the tilt might be useful. It is a satisfying single player experience, but I hoping a way can be found to get online multiplayer to work in the future, as I can easily see online races being just as frenetic and fun as the online multiplayer mode of Super Stickman Golf.